I make no secret of the fact that I'm obsessed with Japan. Obsessed I tells ya. One of the many reasons I am a steadfast Japanophile is this little shop on Takeshita Dori, Harajuku. I think it sells jeans and stuff, but who really cares. I'd much rather believe it was an anatine containment facility. It's the little accent mark on the C that makes it so charming I think. 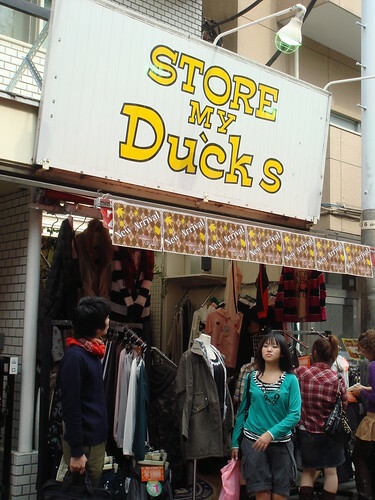 I also like the way the guy at the front of the pic is looking up at the sign as if he tried to go in there to store some ducks and was denied and so he's checking the name again. His bag is clearly stuffed with ducks. Brilliant. I wonder how many random visits you're going to get from this headline?! @chumbles - You have outgeeked me. The only Kusanagi I know is my favourite member of SMAP.